The 10th annual Pope John Paul II Award ceremony took place in Derry Diocese on Tuesday 7 February. 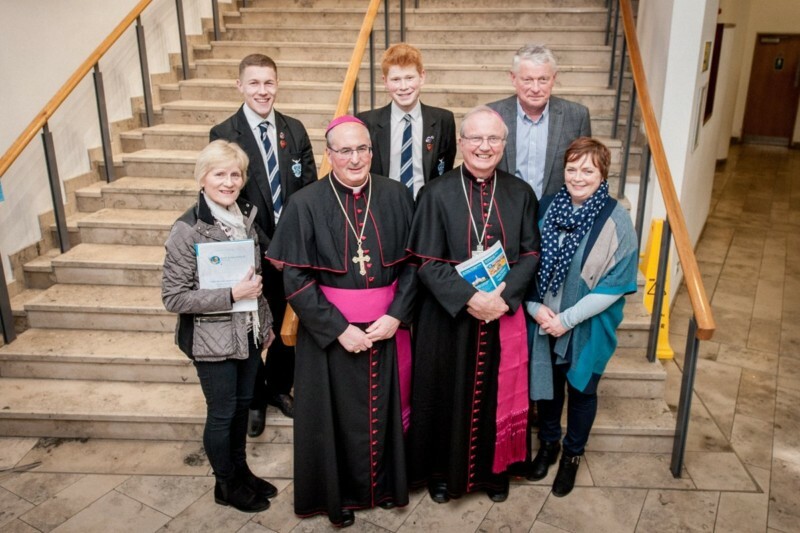 Archbishop Philip Tartaglia, Archbishop of Glasgow, and Bishop Donal McKeown, Bishop of Derry, presented the award to 428 young people from all over the diocese of Derry and beyond in the Millennium Forum, Derry City. The award recipients came from 21 second level schools and they represented 49 parishes in the diocese and 16 parishes from outside the diocese. The award was also presented to young people from Malin Presbyterian Church, Still Waters Elim, and Cornerstone City Church. The Pope John Paul II Award was launched in Derry in 2006 by Archbishop Giuseppe Lazarotto who was Papal Nuncio to Ireland at the time. In the last ten years about 25,000 young people have enrolled in the award. Since the programme began in the diocese of Derry a total of 3,845 young people have received a Pope John Paul II Award. The Pope John Paul II Award has developed into the the largest youth movement in the Church in Ireland. A busy year lies ahead for the programme as a number of events have been planned to celebrate 10 years of the award in Ireland. There will be a day of celebration in Knock on Wednesday 5 April. This day is for people doing the award at the moment and those who have received their award over the last ten years. Later in the year on 30 October there will be a Pope John Paul II Award pilgrimage to Rome. This pilgrimage is for those over 18 who have completed the award in the past. A book will also be published later in the year recording the experiences of many young people who have taken part in the award. When the award was introduced in Derry Diocese 10 years ago it was never imagined that the award would spread beyond the diocese. However in the last 10 years the award has been introduced in 22 dioceses in Ireland. It has also been introduced in England to the Archdiocese of Birmingham and the diocese of Hexham and Newcastle in England has also introduced the award. In 2016 a new role of international coordinator was created for the Pope John Paul II Award and Mr Tony Brennan was appointed to this role.